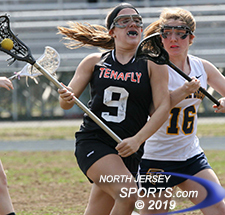 Alix Sunshine scooped up a game-high 8 groundballs for Tenafly, which evened its record at 1-1 on the young season with a 14-7 win at Saddle Brook on Saturday. 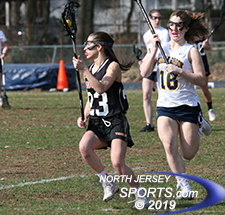 SADDLE BROOK – Despite having just three wins last spring, Tenafly’s girls lacrosse team came into this season with the goal of contending for a league title. With plenty of seniors returning to a team that is in just its third year of varsity play, even a season-opening setback to Westwood could not diminish the Tigers’ optimism. Having put the loss in the rear-view mirror Tenafly’s Alex Nelson set an early tone against Saddle Brook before finishing off the pesky Falcons late. 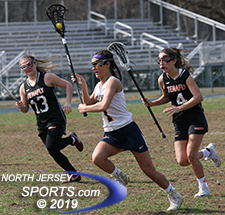 Nelson scored twice in the first 50 seconds of the game and teammate Catherine Santiago added a career-high six goals as Tenafly notched its first win of the season with a 14-7 victory in Saddle Brook on Saturday morning. Nelson won two draws and took advantage of those by quickly putting her first two shots in the back of the net to give the Tigers a 2-0 lead before the game was a minute old. Alexis Van Ben Schoten scored twice for Saddle Brook. Santiago got rolling by creating two turnovers in front of the net and cashing in. Tenafly continued to press but Saddle Brook goalie Kayla Chowdhury made several nice saves to keep the Falcons in the game until her teammates settled in. Alexis Van Benschoten’s second goal of the half off of a long run cut the lead to 4-3 before Santiago struck again late to keep Tenafly in front, 6-3, at halftime. “I thought we forced some shots and some passes too often in the first half, so we talked at halftime about slowing things down when we had possession,” said Tenafly head coach Devin Feeney. The lead was still three goals when the Tigers got a much-needed spark off the bench. Ava Biberica scored twice in a three-minute span sandwiched around another goal by Santiago to create some distance with the Tigers scoring six of the game’s final eight goals en route to their first win of the season. Alix Sunshine led all players by scooping up eight ground balls for Tenafly (1-1). Emma Kim added a pair of goals with Kayla Limbardo chipping in a goal and two assists. Crystal Cannici and Van Benschoten each scored twice with Mia Larsen and Erica Frank scoring once each for Saddle Brook (0-2). After going winless last year, the Falcons feel that the program is finally making strides and will be more competitive this season. After a pair of three-win seasons in the first two years as a varsity program the Tigers are hoping this is the year where things finally click and the results reflect the growth of the sport in Tenafly.